Whenever I see my friend and former colleague who had a liver transplant 20 years ago, I always think for a second about Tommy Douglas and the CCF-NDP, without whom this man who is now in his early 70s would be dead. Since the operation, the Ontario health-care system has paid for the anti-rejection drugs my friend needs to remain healthy, and to enjoy the active life he has led since the surgery. In the United States, few health care plans would cover such an expensive procedure and its aftermath. Many Americans who were faced with the same medical condition are dead because they lacked the coverage and means to finance the surgery and the drugs they desperately needed. Without the NDP and its predecessor, the CCF, Canada would not have a universal health-care system that is so superior to its American counterpart. I have less positive thoughts about the NDP when I think back to the spring of 1972, when Ontario party leader Stephen Lewis and his followers threw the Waffle movement, to which I had devoted much of my energy for the previous three years, out of the party. (We were not expelled as individuals, just told that if we kept up our activities—campaigning for public ownership of the major foreign-owned oil companies, for the recognition of Quebec as a nation and to halt the erosion of Canadian manufacturing industries—we would have our memberships torn up.) Much has been published this year about the 40th anniversary of the youthful political movements that confronted governments, universities, political parties and trade unions in Europe and North America in 1968. When the NDP threw out the Waffle and showed that it could not accommodate ’60s radicalism, the party lobotomized itself—a procedure not covered by medicare—from which it has never fully recovered. For me, the NDP is an indispensable Canadian institution that ought to be critiqued, challenged, nurtured and supported. I believe the party has fallen on bad times, the consequence of too narrow a conception of politics, too great a preoccupation with parliament and too little connectedness with what is happening in our society. On election night in January 2006, Jack Layton declared that Canadians had “voted out of hope for change” and expressed the conviction that the NDP caucus, 29 MPs as compared with 19 in 2004, would help place working people and seniors “at the front of the line” where they belong. Layton has been proved stunningly, embarrassingly wrong, however. The Harper minority government has turned out to be more insistently, stubbornly right-wing than anyone predicted. On childcare, Stephen Harper did exactly what he said he would do—he scrapped the national program. On the Kelowna Accord, the Conservatives have scuppered a historic deal that had been years in the making and that would have provided billions of dollars in development capital for Aboriginal peoples. On relations with the U.S. and on foreign policy issues, Harper has overtly aligned himself with George W. Bush. Meanwhile, the Liberals have been stumbling around, not daring to challenge Harper on the basic direction of the country, promising even deeper corporate tax cuts than the Conservatives and siding with the government on the extension of Canada’s military mission in Kandahar until 2011. Harper’s priorities are unswervingly clear: cut taxes; increase military spending; impose no environmental regulations that will inconvenience the petroleum industry; decentralize Canada and win the votes of soft Quebec nationalists in the process. Anyone who now imagines that if Harper wins a majority he will not decimate the social state in Canada has not been paying attention. Following a Harper majority government, Canada would not be the same country, and the NDP ought to come clean about that. If there was ever a need for a socialist party, allied to broader social movements, whose goal is to provide a critique of what is going on and a program aimed at transforming our society, it is now. That party, though, must never shrink from telling Canadians the truth because it fears that in doing so it could harm its quest for votes in the short term. This summer, social democrats celebrate the 75th anniversary of the founding convention of the Cooperative Commonwealth Federation in 1933 in Regina and the adoption of the Regina Manifesto as the new party’s program. The Regina Manifesto advocated widespread public ownership of key sectors of the Canadian economy. Its clarion call was that “no CCF Government will rest content until it has eradicated capitalism and put into operation the full program of socialized planning which will lead to the establishment in Canada of the Cooperative Commonwealth.” A cursory glance at the document reveals that the founders of Canada’s social democratic party—the NDP is the successor to the CCF—were prepared to critique capitalism for what it was, and they advanced a program aimed at making fundamental changes. If none of this seems at all like the mildmannered NDP of today, there is a reason for that. When the CCF-NDP was founded, there was a creative tension between movement and party. CCFers cared about the long-term struggle to win people to socialism as well as the short-term effort to elect members to the House of Commons and provincial legislatures. That tension has ceased as a consequence of the total, or near total, victory of the party side of the equation. Socialism, anti-capitalism and the commitment to a fundamentally altered society have been dropped from the NDP program and are nowhere to be seen during election campaigns. Socialism is a kind of friendly ghost that haunts a party whose program and whose outlook are no longer socialist. The basic reason the NDP needs to be rehabilitated is the same reason the country needed a socialist party in the first place. We live in a highly unequal society that is rapidly becoming more unequal. It is the rapacious capitalism of our era that makes a socialist movement and party a necessity. The NDP needs a different conception of the role of the party, of its members, leaders, members of parliament and provincial legislatures, and its relationship with the broader progressive communities in the country. The NDP leadership has always tried to put off demands for basic debate about the role the party plays by insisting that “this is not the time for it.” In their eyes, it’s never the time for it. We need to insist. Globally, the wealth gap between workers in poor countries—many of them women and children, who produce the imports for the first world—and the tiny elite that sits atop the global system, is as wide as was the gap in the pre-capitalist feudal order in Europe. Forget the soft sounding term “neo-colonialism,” often used to depict relations between the developed world and the poor world. The level of exploitation that exists today matches that of colonial times. Closer to home, a 2007 report for the Canadian Centre for Policy Alternatives concluded that the weath disparity between the rich and the rest of the population is rapidly widening. By 2004, the richest 10 percent of families were earning 82 times as much as the poorest 10 percent. By comparison, in 1976, the difference was 31 times. In the United States in 2007, the relative wealth gap between rich and poor was wider than at any time since 1929, the eve of the Great Depression. Seventy years ago, the remuneration of a top American corporate manager was 68 times that of a typical employee. Now the top manager makes 170 times as much. The American figures may be worse than ours, but we’re moving in exactly the same direction. In addition to the sorry state of things reflected in these figures, there is the hard fact that the world is headed into a major economic crisis, from which Canada will not be exempt. Working people, the unemployed, immigrants, single mothers and their children, and native people will pay the highest price. Meanwhile, financial institutions will be treated to lavish bailouts, paid for by the taxes of wage and salary earners. At the helm is a government whose approach to the social order is summarized by Finance Minister Jim Flaherty’s insistence that the solution to bad economic times is ever-steeper corporate tax cuts. Flaherty is the John McCain of Canada, a believer in supply-side economics and the Tooth Fairy. The social democratic critique of the Liberals and Conservatives is that they are both business parties, the Bobbsey Twins of Bay Street. The critique is not inaccurate, but is altogether too broad a generalization to be of much use except as a rhetorical vehicle. The NDP suffers from Liberal envy. NDP leaders have long wanted to replace the Liberals as a major party to make of the Canadian political system what social democrats have always seen as “natural”—a system in which a major party of the left takes on a major party of the right. The model social democrats had in mind was that of Britain, where the longestablished Liberal Party had shrunk into minor party status, to be replaced by the Labour Party as the alternative to the Conservatives. Nothing has annoyed Canadian social democrats more over the past 75 years than the failure of the Liberals to give up the ghost, which was the original aspiration of people like Tommy Douglas. In its battle to replace the Liberals as one of the country’s two major parties, the NDP has watered down its socialism almost to the vanishing point. There were two ways in which the social democrats failed to understand the Liberals. First of all, the Liberals had their own progressive roots in the failed rebellions of 1837-38 in Lower Canada and Upper Canada. In those struggles, the reformers and would-be revolutionaries could point to the American and French revolutions and to the radical British Chartists as being among those from whom they drew political and intellectual inspiration. They came by the colour red honestly, to the unhappiness of the social democrats who got stuck with orange, having flirted with green before abandoning the colour (much to their chagrin today). For their part, the Liberals have made strenuous efforts to put their radical history behind them, especially in Quebec, where the rouge heritage put them up against the enormously powerful Roman Catholic Church. The other thing the social democrats did not understand about the Liberals was that in the late 19th century, the party managed to reinvent itself as a European-style Catholic-centre party. During the 20th century, the great achievement of the Liberal Party was to make itself the more or less permanent home of Catholic voters—not only of francophones, but of Irish Catholics and later of the post-Second World War Catholic immigrants from Europe, notably the Italians. For most of the 20th century, the religion of voters was a much surer indicator of the party they would support than social class, rivalling language and region. In a country that has become nearly 50 percent Roman Catholic (though not necessarily practising Catholics), this correlation gave the Liberals enormous staying power. Meanwhile, the CCF-NDP suffered from the fact that among the midwives at the party’s birth were Protestant clergymen. Despite the best efforts of social democrats, they could never succeed in removing the scent of Protestantism that Quebec voters found so off-putting. In the end, Pierre Trudeau, who was attracted to social democracy and was an admirer of the CCF-NDP, decided that if he wanted to have a serious political career it would have to be as a Liberal, a party he scorned until the early 1960s, rather than in the marginal NDP. If social democrats have never wanted to take a clear look at the Liberals, because they want to replace them, they have also avoided being realistic about the Conservatives, because they’d rather not acknowledge how right-wing their own party has become. Under the leadership of Brian Mulroney in the 1980s, the Conservatives dropped the nationalism and Red Toryism that had been important elements in the party’s past, and opted instead for neo-conservatism. This meant that the adherents of the Canadian right took on the role of uncritical enthusiasts for the American socio-economic system and for the tightest possible alliance with the U.S. in global affairs. The Conservatives represented the segment of the Canadian population that had little or no fundamental attachment to the idea of Canada as a country separate from the United States, a stance that leads inexorably toward the elimination of basic differences between Canada and the U.S., certainly including the euthanizing of the social democratic tendency in Canada. The campaigns of the party establishment to replace the Regina Manifesto with the Winnipeg Declaration of Principles in 1956 (which effectively replaced socialism with the humanization of capitalism as the party’s objective), to suppress the Waffle in the early 1970s (to eliminate a grassroots movement that sought to move the party to the left) and to contain the New Politics Initiative a few years ago, were episodes in a decades-old effort to make vote winning the paramount, almost exclusive, legitimate activity of the party. The historically successful drive to drain party membership of any real political content and to vest almost all power in the hands of the leader and his or her operatives has had the effect of making the tactics of each election campaign the only thing that really matters. And since the success of leaders is judged almost wholly by how many seats they win, ambitious NDP leaders have reached the not surprising conclusion that the party will tolerate virtually anything as long as it promotes the winning of more votes and more seats. Instead, the NDP needs to evolve into a movement-party dedicated to promoting the interests of working people and the interests of Canadians as autonomous actors, as free as possible from the constraints imposed by the American empire. Winning people over to the NDP’s point of view is often, but not always, in line with the tactically optimal way to win more votes for the party. The tension between building the movement and winning converts, on the one hand, and winning votes, on the other, is necessary to the success of social democracy. This is true, not least, because in pursuit of fundamental reforms, social democratic governments cannot act without the support, indeed the leadership, of social movements. Without serious mobilization of large numbers of people to counteract the weight of business, nothing important will happen, and social democrats will be condemned to being little more than cleaner Liberals. In the 1930s, social democrats understood that they needed to nurture a political culture and an intellectual climate in which socialist ideas would be embraced. CCF meetings were serious occasions for learning, discussion and debate. Under the aegis of the League for Social Reconstruction, socialist thinkers wrote books on the future course of Canadian social and economic policy. In 1935, the LSR published Social Planning for Canada, a penetrating analysis of what ailed Canadian society during the Depression. Some of those active in the LSR were F.R. Scott, Frank Underhill, John King Gordon, Graham Spry and Leonard Marsh. It’s been a long time since anyone looked to the NDP for ideas. The trouble with encouraging thought and creating a culture where ideas can flourish is that ideas come with controversy and searing debates about what the party stands for and what its tactics should be. I’m not sure whether the leadership wanted controversy during the 1950s. Having lived through it, though, I am sure that it didn’t when it got it during the Waffle years from 1969 to 1972. When the party threw out the Waffle, they made it clear that thinkers were not wanted in the party. Subsequently, many artists and writers gave the NDP a wide berth; they may have voted for NDP candidates, but they did not feel at home in the party itself. The Aspers stepped in as Black withdrew and now run a media empire that is Canada’s “Fox lite,” committed to shifting the dialogue in the country dramatically to the right. David Frum, Robert Fulford and—until recently—Andrew Coyne at the Post and Tom Flanagan at Stephen Harper’s elbow, along with the rest of the neo-con wolf pack, actually care about ideas. They don’t merely want to hold office, they want to change the country (something social democrats used to care about). The fact that they aspire to the destruction of virtually all that is progressive in Canadian life does not detract from their seriousness. They are not content to become members of a centre-of-the-road Canadian government. J.S. Woodsworth, Tommy Douglas and David Lewis were also not interested in simply sitting at a cabinet table. They were determined to create a Canada in which the power of the capitalists to exploit workers was sharply reduced and the lives of wage and salary earners were dramatically improved. If they had simply wanted to hold office, they could have signed on with Mackenzie King, St. Laurent or Pearson and they would have been welcomed with open arms. And there is an important difference between those on the right and those on the left who seek fundamental change. The right can achieve crucial changes that are exceptionally difficult to reverse because they speak for the leading elements of the business class. When the members of the Mulroney government, with the overwhelming support of business, signed a trade deal with the United States, they locked measures into it that meant that no future Canadian government could reintroduce the elements of the National Energy Program without seeking the repeal of the FTA and NAFTA. Future steps by a Harper government would have the same weight and historic consequences. On July 1, a large majority of the province’s doctors went on strike to combat medicare. The strike, watched closely across North America, had the full support of the Canadian and American Medical Associations, the continental insurance industry and most of the wider business community plus the backing of the editorial pages of almost all of the continent’s daily newspapers. Three weeks later the strike ended and the doctors returned to work, and within a few years, the federal Liberals had offered funding to any provincial government that agreed to sign on to the principles of medicare. All of them did. Medicare changed Canada. Even though right-wing governments have tried to undermine the public health-care system by opening the door to private hospitals and clinics, they have not been able to challenge medicare head-on. With this campaign, Canadian social democrats achieved what American liberals during the Clinton administration never could. They had presided over a profound change in the political culture, and they did it because the Saskatchewan CCF was a genuine people’s party. Few members were business executives, and not many were direct owners of small businesses, with the exception of family farmers (and these were a small minority of the Saskatchewan party membership by 1960). While the business community could put external pressure on the CCF government in the province, as it could on any government, the party itself was quite impervious to its coercion and that made the CCF very different from the Democrats in the United States and the Canadian Liberals. Not accidentally, the medicare breakthrough came at the high point of the progressive era of the postwar decades. This was no nirvana, but in Canada, the United States and Western Europe, trade union membership was on the rise, social programs were being established and access to higher education was widening. Europe was the most advanced in this process, followed by Canada, but these were also the great years of the American Civil Rights Movement, as well as the Great Society programs. In today’s neo-conservative environment, it is dauntingly difficult to achieve social policy breakthroughs—for instance the establishment of a universal, comprehensive early childhood education system beginning at age two, along the lines of the system that has existed for many decades in France. There is a strong movement in Canada that has struggled for many years for such a program and the NDP supports this aim. What is needed, though, is a much more powerful connection between movement and party, so that the NDP is committed to advocating this childcare program and is prepared to fight for it in the public arena, as well as in the House of Commons. A becalmed political party like the NDP is of limited use to working people in a mean-spirited time such as ours. We don’t need a party that no longer knows how to fight and has lost the combative edge of the social democrats of earlier decades. On the issue of Afghanistan, for instance, the NDP does call for Canadian troops to be brought home, a position that recognizes that Canada’s military mission is in support of an American invasion and is not a struggle for human rights and democracy. The NDP’s stance on the issue is admirable and Jack Layton and other party MPs have been subjected to considerable abuse for it in the media and by government ministers. Remember “Taliban Jack”? Canada’s social democrats need to use considerable acumen in the way they steer their vessel. In the 2006 federal election campaign, they made the serious error of failing to warn Canadians about the dire consequences of a Harper government for progressive causes in Canada. Party strategists insisted they were not going to help the Liberals by “demonizing” Harper. To this day, the NDP has been unwilling to present a broad and accurate critique of how dangerous Harper, his party and the business interests for whom they speak, are for Canadians and for the viability of Canada as a sovereign state. Absurdly, one is more likely to get a sweeping assessment of the implications of neo-conservatism from Liberals, who will do little to reverse Conservative policies if they are elected, than from the NDP. The consequence of the NDP’s tactical stance is that the party ends up as just another liberal party, operating from a somewhat more progressive vantage point. The lack of a compelling vision has left the NDP looking much like the other parties, which is why so many people who are searching for something genuinely different are opting for the Green Party. There have been moments in the history of the NDP when the party has stood on principle, leaving shabby tactics to the side. One came during the October Crisis of 1970. After cells from the Front de libération du Québec kidnapped James Cross, the British trade commissioner in Montreal, and a few days later kidnapped Quebec labour minister Pierre Laporte, the Trudeau government proclaimed the War Measures Act and dispatched soldiers to the streets of Montreal. The next day, the body of the murdered Laporte was discovered in the trunk of a car. The draconian powers of the War Measures Act allowed the government to arrest hundreds of people and hold them for weeks without charging them with an offence. The night the act was proclaimed, the Montreal police began rounding people up. The act also allowed the government to censor the media. In the course of a few days, the government acquired dictatorial powers and public opinion polls showed that about 90 percent of Canadians approved. Tommy Douglas, David Lewis and most of the members of the NDP caucus in the House of Commons did not approve. Alone in Parliament, they opposed the imposition of the War Measures Act, arguing that the Criminal Code provided the sanctions needed to deal with the wrongdoers. In the short run, what Douglas and Lewis did bled support away from their party. In the long run, however, the NDP not only took a stand for civil liberties when it was crucial that someone do so, but the party gained respect and reinforced the view of the NDP as an institution to which Canadians looked for leadership. Today, those who see the need for the party’s rehabilitation must provoke an upheaval—I suggest an upheaval because the entrenched leadership of an organization can rarely be expected to generate basic changes that would include reducing its own authority. There is always talk in the NDP about how the party should draw closer to social movements and to trade unionists. For the most part, though, this is just talk. 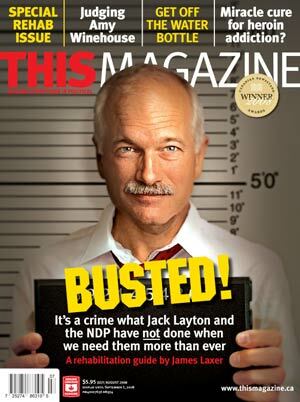 I haven’t given up hope for Jack Layton in all this. Whatever his shortcomings, Layton is by far the most accomplished leader in federal politics today, with a program that makes far more sense for Canadians than the alternatives. Admittedly, the competition is not impressive. Stephen Harper represents all that is reactionary; Stéphane Dion has squandered his reputation for being a man of principle; Gilles Duceppe has dispensed with progressive ideas and has taken to inciting suspicion of immigrants, the hallmark of old-style ethnic nationalism; and Elizabeth May rides a wave of sentiment in search of a party. Layton’s political activism over many years before he became NDP leader shows that he understands, or once understood, the importance of social movements and the way movement politics is needed alongside electoral politics. An upheaval could do him good, but don’t count on him to start it. That’s up to the rest of us. At 75, the social democrats are worth rehabilitating. Young movement activists, who have been inclined to give all political parties a wide berth, should take a hard look at the NDP. While youthful activists have placed issues on the agenda and have had an undeniable political impact, their proclivity for avoiding party politics has kept them at the margins. They should consider joining the NDP en masse, respecting its traditions, but insisting on making it their party. The leadership of the party won’t like it. What else is new?